Never grow out of the home you love. If you want the space and sunshine of a patio, but prefer to stay indoors, let us design and build a room addition or sunroom for your home. Our experienced team can custom-design any room addition project whether it’s a living room extension, a sunroom, an extra garage, or a guest house. No project is too big. We serve the Houston and Dallas – Fort Worth areas. If you have questions about room additions, please call (281) 265-1994 in Houston or (972) 915-2727 in Dallas. 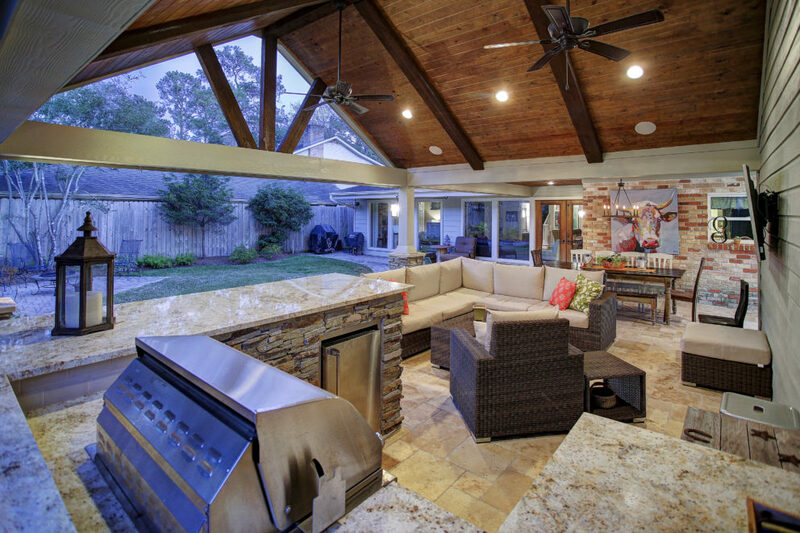 Texas Custom Patios will build your room addition just as sturdy as your home. We use traditional, wood-frame construction, the same construction used on houses. Your room addition will add value to your home. Your project developer will meet with you to discuss what you want and will help you match both the interior and exterior of the new room to your existing home. We will provide you with customized specifications for your new room addition, so you will know exactly what you are getting before it is built. Every detail will be addressed by Texas Custom Patios – from the foundation to the roof to any special items you want to include inside. Originally, we built this as a screened porch with brick knee walls and suntex solar screen.